To access parking: Take Central Street (off Main Street) travel approximately 150 yards. Sign on left OLD COURTHOUSE PARKING. When you enter lot you are at the rear of our building. We cater 20 - 200 people, at your location or ours. Please call for more details. 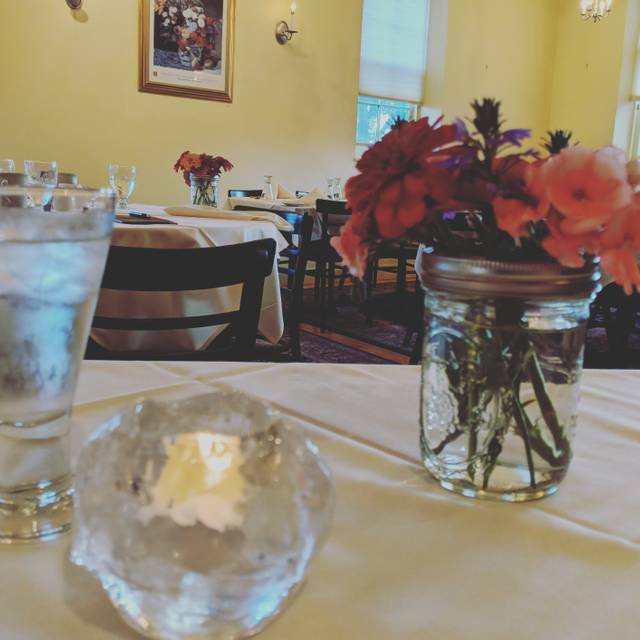 The Old Courthouse is a recent addition to the Newport area dining scene serving Creative American Cuisine in the heart of Newport's Downtown Historic District. Dine in a beautiful Federalist era building. 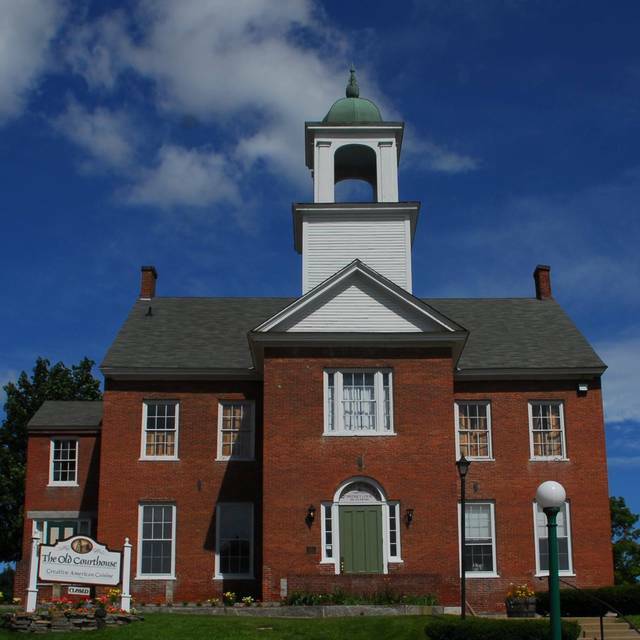 This circa-1826 building served as the district courthouse for the past twenty-five years. It is located behind the Newport Opera House and features an elegant dining room and full service bar. This family-owned business has carefully preserved the elegance and simplicity of the building to provide a unique dining experience. We have never had a bad meal at The Old Courthouse and particularly enjoy the Brunch. 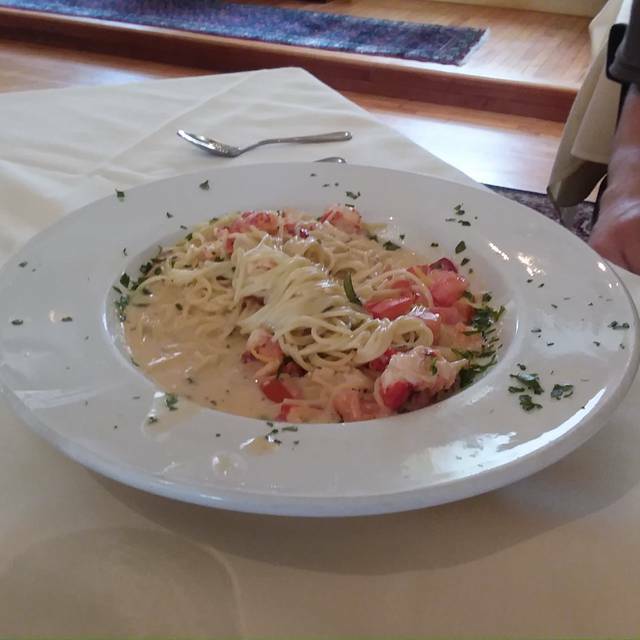 Chef Robert is fantastic, the food is fresh, homemade and delicious and the wait staff is friendly and efficient. Jane has a real winner! The food was superb. The steak was very tender & the coconut cream pie was terrific (although the crust could be a flakier for my taste). We will definitely go back. Went to the Old Courthouse for a birthday celebration lunch. The seating was in the small area by the bar. This was a disappointment because it doesn't have the same elegant beauty of the dining room. The services was excellent. The soup and salad were perfect and the price was right. This was our second visit here and it was excellent. My husband had the rack of lamb and he enjoyed it. Was cooked perfectly. I had the NY Strip steak and it was so tender and flavorful. Servings are huge.The place is beautiful, service is top notch. Would suggest giving it a try if you have not already. We love it here and will be back!! We have lived in Newport for 3 years and had never been to The Old Courthouse. We had heard good things about it so we decided to try it. And, boy are we glad we did. We had a wonderful evening. Everything was awesome. I had the NY strip steak with bourbon Demi glaze. It was done perfectly and was a very good size. It was delicious. My husband had the Rack Of Lamb. He was very pleased with it. Both entrees were served with roasted herb red potatoes and a vegetable medley. And we each had a garden salad. I had the raspberry vinaigrette and I'm glad I picked that one, all were tempting. My husband can't have gluten, but there were a few desserts that are gluten-free. We shared the chocolate ganache that was placed on raspberry mousse!! Delicious!. So much food. We plan to return again soon. I would recommend this to anyone who enjoys good food and a relaxing night out. The Sunday brunch buffet is absolutely delicious. All the food is served fresh and hot with a lovely omelet & pancake station as well. We very much enjoyed their mimosas - I had a pomegranate mimosa which I’d never had before. We would love to have brunch here again. The overall atmosphere was stuffy and there was not a lot of room between the tables. The waitress was fantastic. The food was okay, not worth the 23.00 a meal. I had a 100 gift certificate and found out after we received the bill that the gift certificate does not include alcohol. I have never had a problem with a gift certificate not being able to use it on the bar tab as well. I know have a credit and probably will never use it. A Valentine's treat for sure! We got there early...quiet, quaint, classy...after the piano player began the room filled up, but still nice ambience. Delicious food, friendly, helpful service, timely. Very pleasant evening! Highly recommend! What a wonderful dining experience we had for Sunday Brunch at the Old Courthouse Restaurant. Wonderful atmosphere, with a guitarist and a pianist playing for ambiance. Everything was absolutely perfect. The food was fresh, tasty, and beautifully displayed. I ordered a small mushroom and cheese omelette from the the omelette station, which was wonderfully prepared and absolutely delicious. The ham was moist and flavorful, the maple laced baked beans were divine, the fruit was the freshest and the pastries were fresh, moist and delicious. The coffee and juice were fresh and delicious. I can't say enough about this brunch. The experience was relaxing and could not have been improved in any way. It was perfect. Ceaser salad was wonderful, did not care for the lamb & the salmon with scampi sauce lacked garlic & had a benign taste, likely due to population they serve. I make much better scampi & I'm sure at home the chef does as well. Food in general was fair. We love The Old Courthouse for all kinds of celebrations. Great dinner and amazing brunch. We went here for New Year's Eve and had a wonderful dinner. The food is superb, and the atmosphere is calming and lovely. Usually on a Holiday, a restaurant is not up to their usual standard of food and/or service, but The Old Courthouse was ! We had a choice of rack of lamb, filet mignon, lobster, scallops, and a chicken dish. The filet was cooked to perfection and the scallops were broiled and delicious. The side dishes were served in a timely fashion, not making us feel too rushed. I cannot say enough about this Newport jewel. They also offer a Sunday brunch that is unsurpassed ! We are already making plans to return. Everything was great. Will come back not just on special occasions! It was Thanksgiving afterall. We had 12:30 pm reservations. Seated quickly. Attended to quickly. Noise level increased exponentially. All four of us had our chairs bumped several times because the dining room became packed. The sweet pianist played, with the beautiful sound becoming less and less because of people noise. The food was great but our waitress was respnsible for several so we waited a long time to order dessert and a long time to get our bill. I would go there again but likely not for a major holiday. To be honest one of my guests could smell an unpleasant odor behind him, simulating a dirty cat litter box. It was a smell of a very aged person. This experience made memories, I will choose to extract the pleasantness of this experience, that being the food, the waitperson's pleasantness, the piano man and my own guests. I did not fill out the other categories to recommend, as we had a different experience. We appreciated the restaurant's interest in celebrating Polish Week, and offering some traditional foods, along with community ladies in traditional costume. However, the chef did not have good control over serving the diners.There were only 2 servers, and they were understaffed and stressed. The beef roulade I ordered was so tough, I couldn't even cut it with a serrated knife. This should have been a medium rare dish. My husband's Polish platter had a great assortment of foods, but the pierogies were oily and flat, the galumpkis bland, and mashed potatoes that were not very good. While the owners tried to offer a special few evenings of dining, the chef was not able to manage the volume of orders with consistency or quality. We eat out infrequently, and love home cooked foods. What should have been a fun and tasty outing celebrating Polish culture turned out to be a disappointment. To the owner's credit, my beef roulade was removed from the bill. I wish them better management in the future if they choose to feature foods from other cultures. We occasionally go for Sunday Brunch. Food is always delicious and service is always amazing. This time was no exception. The entire staff is outstanding. this was my first time here and it was fabulous! Quiet. Great service. Great food. The food was excellent! Our server was attentive. The prices were great!! Nicely tucked away in Newport. Its in the old courthouse building, hence the name. Small dining area, quiet (like a library), so conversations can be overheard, but easily ignored. Food changes regularly and is very good. Professional, and friendly, service. If you can't get a reservation on Open Table - just call, they may have space, and there is a bar area. Enjoyed a suburb dinner with friends at The Courthouse. 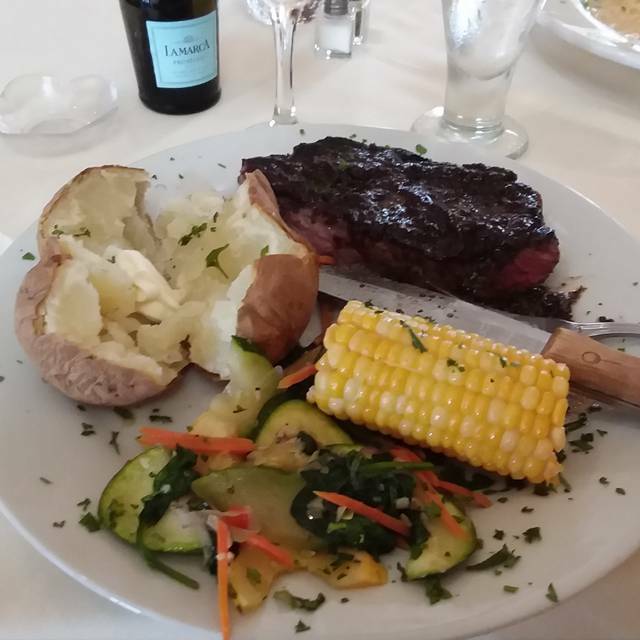 Food was excellent, service outstanding and atmosphere pleasant. The staff and the food was extraordinary. This was a birthday party for family members. The atmosphere was perfect for the occasion. The piano music was a special touch. Would highly recommend this restaurant. Menu has enough choices to meet all tastes. Great food preparation. Delicious sauces. Waitress K.was super. Attentive but not overbearing. Server was polite and well informed, atmosphere was elegant and soothing, food was awesome and well priced. Couldn't ask for more. Very nice restaurant with great service,and the food was delicious! We have been to the Old Courthouse several times, for both dinner and brunch. The food is always delicious, the atmosphere is very pleasant and you can talk to each other without shouting! Wonderful for that special occasion! We always enjoy dining at The Old Courthouse. The staff is friendly, food is great. Very enjoyable experience. Guitar and piano were a little too loud in a smallish space. It was difficult to talk to dining companions. Very disappointing experience. 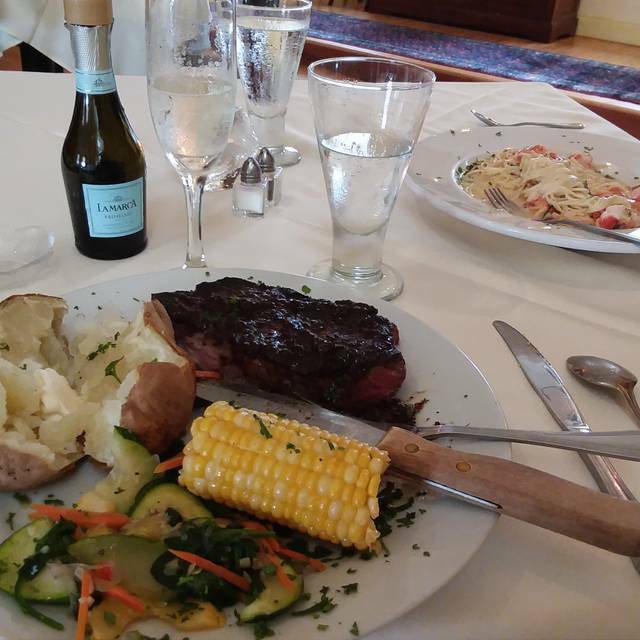 I had heard some good things about the Old Courthouse Restaurant in Newport, NH. Before I decided to eat dinner there, I went with friends to have lunch on 2 occasions. The "comfort" food was quite good, as was the service. Based on my lunch experience, I went with my husband for dinner. My husband started with the crab meat salad in avocado appetizer. He couldn't taste the crab meat, since there was a very spicy sauce that drowned out the flavor. We both had the sea scallops, although they were cooked to the proper tenderness, they were smothered in a purported concoction of artichoke hearts, sun-dried tomatoes, fennel, garlic and white wine. I couldn't find the artichoke hearts. The fennel; however, was overwhelming and the delicate flavor of the seafood we had ordered was obliterated by the taste of the fennel. I couldn't finish my meal. The wild/white/red rice medley side dish reminded me of an Uncle Ben's pouch of microwavable rice. It was gummy. 1 star for the appetizer and entree. Veggies and dessert were quite good and improved the food rating to 2 stars. Our waitress was very attentive, but since there were not that many patrons in the restaurant, I only gave her 4 stars. Bottom line, I would recommend this restaurant for a nice lunch, but I would avoid it for dinner. We dined there the Friday night of Memorial Day weekend and had a 7 PM reservation. Excellent, since day one! A great value and with great music. We will be back, particularly for brunch. Quiet...elegant, yet not formal or off-putting. Food is delicious. Service is friendly and top-notch. An accessible gem. We have lived in the area for years, but just recently discovered The Old Courthouse. We now look for reasons to celebrate, and recommend The Old Courthouse to everyone we know. The food is fantastic, and the atmosphere friendly and inviting. Don't be like us and let time pass...try The Old Courthouse soon!